In a twist on the traditional election debate, cultural leaders took questions from mayoral candidates about art's place in the city. Art on the Ballot panel, left to right: Dalton Higgins, Shannon Litzenberger, Yasmin Parodi, Sarah Garton Stanley, and Joe Lobko. The Toronto mayoral election is more than two months away, but voters have already had ample opportunity to hear their candidates debate. So Tuesday afternoon at the Theatre Centre on Queen Street West, debate organizers flipped the script: instead of the having candidates answer questions from experts and special interest groups, Art on the Ballot featured experts from Toronto’s art and design industries taking questions from the people running for office. Presented by SummerWorks and Toronto arts lobby group Artsvote, the event gave Toronto’s creative class a chance to have their voices heard and offer guidance to candidates on the issues that matter to them. The panel comprised five leaders in art and design: Joe Lobko, a partner at DTAH architecture firm; Sarah Garton Stanley, associate artistic director of English theatre at Canada’s National Arts Centre; Shannon Litzenberger, a dance artist, writer, director, and arts advocate; Yasmin Parodi, a multi-disciplinary artist and youth representative; and Dalton Higgins, a performing arts and concert presenter, journalist, and author. Kathleen Sharpe, executive director of the Ontario Cultural Attractions Fund, moderated the discussion. Participating mayoral candidates submitted their questions ahead of time. Although David Soknacki and Olivia Chow were the only two big names in attendance, lesser-known candidates Ari Goldkind, Matthew Crack​, James French, and Dave “Sketchy the Clown” McKay came out. John Tory and Mayor Rob Ford each sent in questions. Some candidate queries might have been better answered with specific policy recommendations or reams of data rather than a somewhat informal panel discussion. 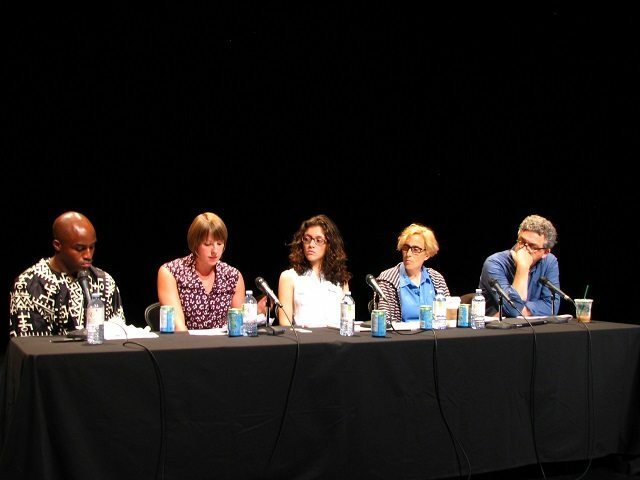 But the panelists did provide strong justifications for the arts as part of a vibrant, successful city, and outlined the needs Toronto’s diverse arts community would like the their next mayor to meet. Stanley stressed the importance of looking at success both from financial and non-financial perspectives. “My deep concern is that we will forget as creators that [the profitability] is not why we’re doing it,” she said. CORRECTION: August 13, 2014, 4:55 PM This post originally stated that mayoral candidate Michael Nicula attended the event; in fact he submitted questions, but did not attend. We regret the error.